With the sun shining down and the wind in our hair, we kicked off our May 6th Blue’Aina reef cleanup with lots of smiles and eager volunteers. Sponsored by Trilogy Excursions, volunteers gathered at the Lahaina dock along with members of our non-profit organization, the Malama Kai Foundation, and settled in for a fun-filled day of giving back to our beloved ocean. A well-known lover of all things nature, Trilogy’s commitments to the environment go far beyond sustainable tourism. While in and of itself, sailing provides a hugely needed reduction off the country’s crippling dependence on fossil fuels, Trilogy was also the first company on island to retro-fit ALL of its boats with the ability to pump out waste at onshore facilitates (rather than dumping at sea). In the most public of examples, Trilogy employees were so passionate about protecting this beautiful land that they founded the Blue’Aina reef cleanup program in 2010 (ie: the reason for the blog you’re reading at this very moment ;). Most recently, Trilogy converted one of its boats to run entirely on biodiesel, which helps to remove grease waste from landfills and further eliminates the need for burning fossil fuels. From reef protection to active community involvement to the extensive bi-annual certification process as an Eco-Tour operator in Hawaii, Trilogy upholds its sustainable living philosophies, and was honored to sponsor the Malama Kai Foundation for May’s reef cleanup. The Malama Kai Foundation was founded in January, 1991, with a mission dedicated to ocean stewardship for current and future generations, and a primary focus on community service and public education. The foundation prides itself on sponsoring ocean and environmental charitable activities in order to urge others to engage in marine conservation and live a life of sustainablity. The second (and equally important) purpose of Malama Kai? Education, education, education. While individual volunteer events are (clearly) our FAVORITE and give us all those feel-good vibes, the key to our land’s sustainability lies in the continuation of a responsible lifestyle, extending long after the event has ended. So why did Malama Kai choose a coral reef cleanup? Perhaps one of our favorite fun facts will help with the answer: an entire QUARTER of ALL marine life depends on coral reefs for their survival, and THAT web of life subsequently supplies us (us, as in all of us human types) with 50% of the oxygen in our breathable air. Fifty. Percent. Now that’s impressive, and it also happens to coincide with one of Malama Kai’s primary programs, making this collaboration a perfect match. Assisting with the Hawai’i state-wide “Day Use Mooring Program”, the Foundation formed a working group that helps to improve efficiency, coordination, and standardization for these much-needed buoys. 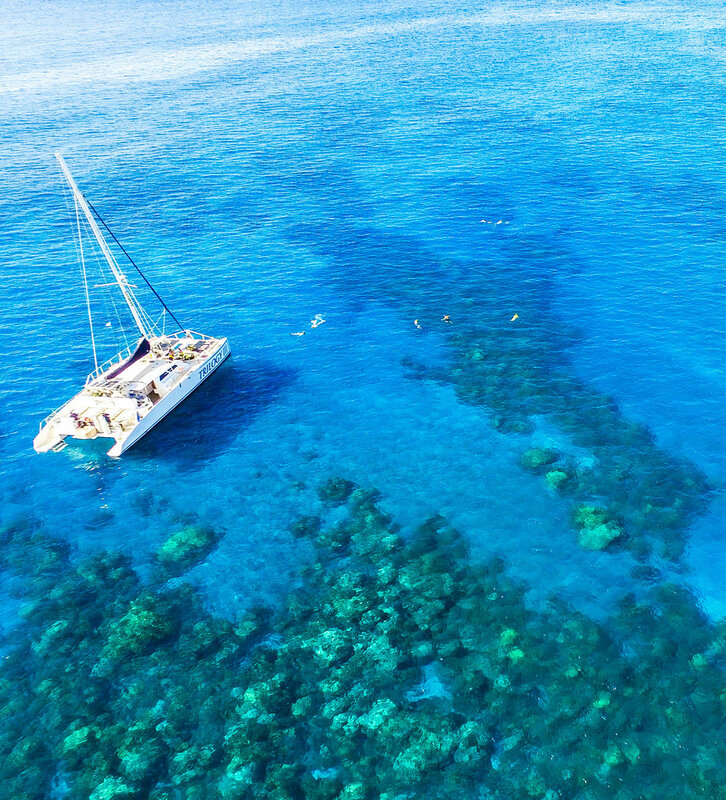 Day Use Mooring is a vital part of our sustainable living model here on the islands, providing underwater open mooring for boats, which helps to protect nearshore reefs in areas of high anchoring pressure. This method of self-directed coastal management is crucial in Malama Kai’s ongoing efforts to protecting our natural marine resources, and as we set sail toward our cleanup location, our guests were delighted to hear all about their meaningful mission. To get away from the imposing wind line, Captain Katie decided on Coral Gardens as our final destination of choice. Coral Gardens and the surrounding reefs are home to the Hawaiian green sea turtle (our lil honu! ), manta rays, and hundreds of endemic fish species of Hawai’I, which also makes it a popular coastal fishing location. Where there is fishing, there is fishing line. Snagged fishing hooks and fishing line often float on (and in) the water here, and what we found on this day was no different. An hour into the water yielded 5 giant handfuls of fishing line, leaders, hooks, and weights. Lucky for us, our May Blue’Aina volunteer list brought with it a particular guest who coincidentally assists at the Maui Ocean Center, collecting previously used fishing weights and remaking them into diving weights. It was high-fiving all around on board, as we proudly cleaned up our beautiful Maui reef and then used our spoils to donate close to 4lbs of fishing weight to the Ocean Center, ready to be sustainably repurposed. After a highly successful day cleaning up the offshore waters, volunteers climbed back aboard to enjoy a delicious lunch provided by Trilogy, and catch some warm Maui sunshine rays as we sailed back to Lahaina Harbor. Trilogy has one more underwater reef cleanup scheduled in June, before we concentrate our efforts on public education and land-based outreach activities for July and August. Head over to the website for trip details and to sign up - we hope to see you out on the water with us on June 3rd!